Once upon a time, when I was a little girl in a world that felt like it was made of stories, my mom would call me away from playing make-believe when it was time for lunch. Usually, lunch was a grilled cheese sandwich with a glass of milk, or a cream cheese and jelly sandwich with a glass of milk. My mom was always a big believer in making sure little girls got plenty of calcium to build healthy bones. She gave me milk with every meal all through my childhood. She didn’t have as much success getting me to eat my veggies, though she found some creative approaches like telling me artichoke leaves were a special treat because they were so fun to dip in melted butter. (People didn’t worry much about cholesterol and fat in those days.) Of course my tastes changed when I grew up; now I often eat a sandwich on a bun, along with a salad or fruit. But I decided to have something different for lunch today—a grilled cheese sandwich cut on the diagonal, like my mom made. 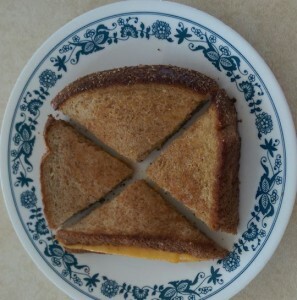 I never knew why she cut sandwiches like this—maybe so that my sister and I would be more likely to eat the crusts? The grilled cheese sandwich shown in this picture isn’t quite the same, of course. Wide loaves of bread weren’t popular when I was a child, so the bread would have been square; and it would have been white bread, not the whole-grain variety I ate today. But even though it wasn’t exactly the same, looking at that sandwich on my plate gave me a comforting feeling that all was right with the world. I had a sense of being well cared for, along with a lighter, playful mood. Although it’s not literally possible to go back to childhood (and most of us wouldn’t really want to do that anyway), finding the little things that trigger those memories can go a long way toward bringing feelings of love and nurturing into our present-day lives. Comfort food and specific rituals can often soothe the “what-evers” better than anything else! Yum, toasted cheese, all melty and bubbly. I ate that as a child too; my mom had a little toaster oven that was just the right size for it. Hadn’t thought of it in many years, so thank you too! I have never been to Wales, but would love to travel there someday. At present I’m reading Sarah Woodbury’s alternate history and time travel “After Cilmeri” book series, in which Prince Llywelyn is not killed in 1282 but becomes king of an independent Wales. Fun summer reading! Comfort food nurtures the spirit…and it’s usually…super scrumptious too!